"'Tales From Beyond' is one of the best metal albums I have heard in many years and it will be a must buy for anyone fortunate to hear it. Every now and then you put on an album that makes you sit up and forget everything else until it is finished and this is such an album. From the bombastic opening refrains of 'Dykemaster's Tale' right through to the three part album closing epic, 'A Tale From Beyond', Mob Rules crank up the power to 11 and simply steamroller their way into your brain." (Terry Craven, Rock Society Magazine, July / August 2016). "Having marked twenty years together with the excellent 'Timekeeper' Box set in 2014, Mob Rules march boldly into their third decade with 'Tales From Beyond'. This is no act resting on their laurels or simply celebrating old glories; instead, 'Tales�' finds the band sounding as fresh and vibrant as ever. Combining elements of Prog and Symphonic metal into their sound, yet still hitting home with the power and force they always have, MR have created an attack all of their own�'Tales From Beyond' is unmistakably Mob Rules and it's unmistakable excellent!" (Steven Reid, Fireworks Magazine Apr-Jun 2016). Vital German melodic metal act Mob Rules are set to release their monumental ninth studio album 'Beast Reborn', on August 24th on Steamhammer / SPV as a DigiPak CD, double gatefold orange with black swirls vinyl (with printed inner sleeves + CD in cardboard case), download and stream. A limited edition of 500 box sets will also be available, containing the digipak CD, double LP, a printed towel, 2 track bonus CD, patch, sticker, hand signed photocard and certification sheet. 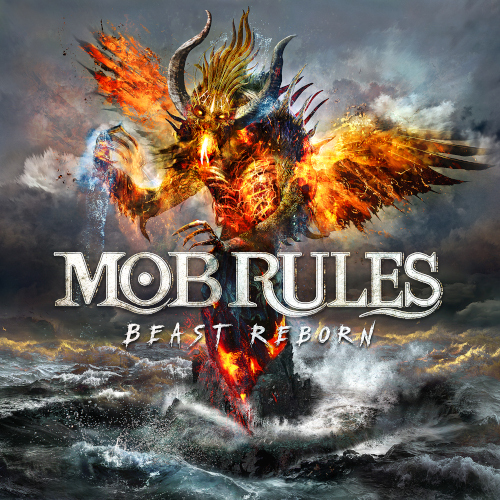 All fired up in the wake of huge critical acclaim for 'Tales From Beyond', the band's last studio album, released in March 2016, Mob Rules were massively focused and buzzing with energy when they went into the studio to put down 'Beast Reborn'. Furthermore, the addition of new band member S�nke Janssen as second guitarist has subtly lifted Mob Rules' sound spectrum a significant level higher with his technically sophisticated yet passionate playing. Lead guitarist and songwriter Sven L�dke was Janssens guitar teacher for many years and brought him into the band, which explains the high level of mutual trust and innate interaction between the two musicians. A fresh, straightforward metal-edged hard rock album packed with powerful melodies and expressive choruses, 'Beast Reborn' is marked by the same 'new directness' as its' illustrious predecessor 'Tales From Beyond'. 'Beast Reborn' was expertly mixed by tried and tested sound engineer Markus Teske (Vanden Plas, Saga, Firewind etc) at his Bazement studio in Germany and then superbly mastered by Jens Bogren (Kreator, Amorphis) at his Fascination Street Studios in Sweden. Bogram states that "'Beast Reborn' is a great album filled with catchy tunes that will stick with you. Fans of melodic metal should definitely check this out!". And when they do, they will, no doubt, be blown away by the band's best album ever. Resurrected – Roland Hyams on 020 8677 8466 / 07768 156392. Mighty German melodic metal act Mob Rules are set to release their magnificent eighth studio album 'Tales From Beyond', a sizzling, heady cauldron of twin-guitar-and-keyboards-led deeply melodic progressive and power metal, on March 18th on Steamhammer / SPV. 'Tales From Beyond' will be available as a DigiPak CD (containing a bonus track + poster), double gatefold white vinyl (with printed inner sleeves + CD in paper sleeve) and digital download; there will be an extra itunes version including an additional exclusive newly recorded bonus track, 'Ghost Town'. 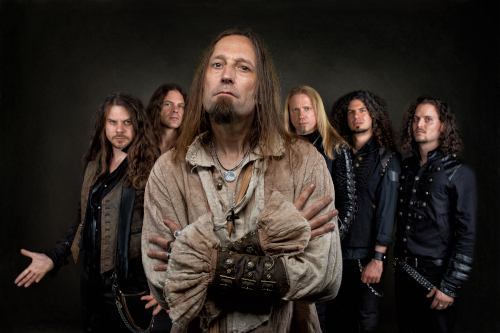 Mob Rules ensconced themselves for ten months in their own Dwelling Mound Studio in Nordenham, writing and refining the eleven gems of songs contained on 'Tales From Beyond', which was superbly produced at his Bazement Studio by tried and tested sound engineer Markus Teske (Vanden Plas, Saga, Firewind etc). The earthy and multi-faceted sound which the band introduced on their last album, 2012's 'Cannibal Nation', has evolved ever further, while their Celtic / British influences have been honed even more finely. 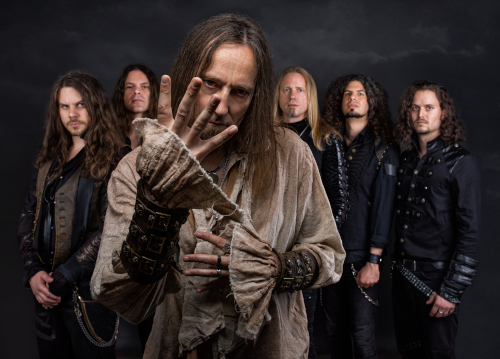 The result is a multi-layered, diverse, powerfully melodic offering, marked by a 'new directness', which can only win over many new fans of these exceptionally talented metal meisters. Lyrically, Mob Rules continue to go down their own unmistakable path, influenced by historical events and inspired by literature. Album opener 'Dykemasters' Tale' is based on 'The Rider on the White Horse' by German writer Theodor Storm, a novella set in northern Germany not far from the band's base. The song 'Somerled' is about a historic character from 1140, half Scotsman, half Viking, who was evicted from his home region of Argyll, went on to reconquer it and eventually made peace with the Vikings by marrying the King's daughter and uniting after two victorious naval battles the occupied Scottish isles under the name of "Kingdom Of The Isles". 'Dust Of Vengeance' sees Mob Rules apply themselves to another chapter of northern German history, this time the Oldenburg author Florian Gerlach's 'Smogger Trilogy' about the sinister thoughts we all occasionally have but never act out. And last but not least, the three-part title track 'A Tale From Beyond', inspired by Andy Weir's bestseller 'The Martian`, which was made into a movie in 2015, Mob Rules present a rather free interpretation of the subject matter with plenty of personal references. 18 months ago Mob Rules celebrated their 20th anniversary with the release of the elaborate and highly acclaimed best-of box set 'Timekeeper'. Powerplay Magazine's Dave Cockett awarded it 10/10, proclaiming "Founded in Northern Germany way back in '94, they've thus far released seven studio albums of sophisticated, highly addictive power metal with an impressively high melody quotient�.A beautifully packed three CD/DVD box set with an extensive booklet, it's obvious that this is far from the 'easy money' cash-in type of release � a real labour of love, this has been meticulously pieced together, primarily from the perspective of their fans, and as such is an absolute must." Now 'Tales From Beyond', yet another 'absolute must', looks all set to blast Mob Rules right into heavy metal's heady Stratosphere. Out there – Roland Hyams on 020 8677 8466 / 07768 156392.